Save 40% on Lakeview Umbrellas & Accessories. Save 40% on ALL Lakeview patio umbrellas, bases and accessories! Add some shade to your outdoor space with a new umbrella. Choose a matching base and an accessory to go with your umbrella! Free shipping offer! Complete your outdoor seating area with protective and stylish shade from Lakeview Outdoor Designs. The 9 foot octagonal canopy is made of solution-dyed, all-weather Sunbrella Canvas Navy fabric, which resists mildew and fading and is vented for comfort and stability. This Lakeview Outdoor Designs umbrella features a crank lift system that makes opening and closing simple and easy, while the auto tilt lets you quickly adjust for the best shade solution any time of the day. 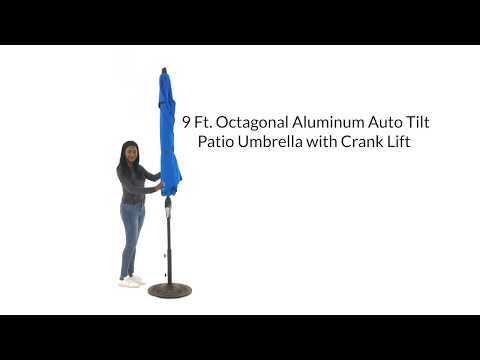 This 9 foot umbrella is perfect for shading a patio table up to 54 inches. The umbrella pole is 1 1/2 inches in diameter and will accommodate most patio tables with umbrella holes and most umbrella bases and stands. Includes a 50 Lb. Moderna umbrella base. Lakeview Outdoor Designs patio umbrellas are designed for residential use and are not warranted for commercial applications. This Lakeview Outdoor Designs umbrella carries a two year limited warranty on frame, ribs, finial, tilt, cord, crank handle, housing, canopy and rib pocket seams. If a defect in the original material or workmanship appears during the warranty period on any Lakeview Outdoor Designs product; Lakeview Outdoor Designs, at its option, will repair or replace the product without charge.